CHICAGO (AP) — Bulls forward Lauri Markkanen is moving closer to his season debut after spraining his right elbow in September. Markkanen has been cleared to “fully participate in practice” on Tuesday, coach Fred Hoiberg said. If that goes well, a timeline for Markkanen’s return could come into focus. “He’s passed every hurdle that he’s had, as far as being medically cleared and going out and doing the individual workouts, having a controlled contact 2-on-2 session and then yesterday coming and going full-court 2-on-2 with some of our players,” Hoiberg said before Monday night’s 108-107 loss to San Antonio. 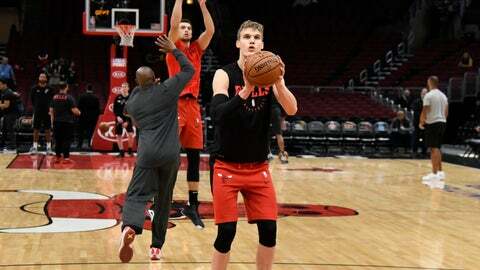 The 7-foot Markkanen is perhaps the centerpiece of Chicago’s rebuilding plan, so the Bulls are looking forward to getting him back on the court. He was selected by Minnesota with the No. 7 pick in last year’s draft and then traded to Chicago in the Jimmy Butler deal. He averaged 15.2 points and 7.5 rebounds in 68 games as a rookie. Hoiberg said the plan is to have Markkanen travel with the team on its upcoming four-game trip. The Bulls have been riddled by injuries this year. Denzel Valentine, Kris Dunn and Bobby Portis also have missed significant time. Valentine is scheduled for reconstructive surgery on his left ankle on Tuesday in Wisconsin. Dunn and Portis were scheduled for conditioning and weight-room sessions on Monday night, and they could participate in the non-contact portions of practice on Tuesday. Dunn is coming back from a sprained medial collateral ligament in his left knee, and Portis sprained the MCL in his right knee. “So they’re going to kind of get on the same path as what Lauri has gone through the last couple of weeks, to start integrating themselves back into the team,” Hoiberg said. Rookie forward Chandler Hutchison returned against San Antonio after missing three games because of back spasms. He finished with four points in 18½ minutes.